I'm not sure how to explain our day today so here it goes. We called OBS Marine Supply this morning at 9:00 sharp and confirmed our tank would be ready for pick up today. They said come by at 5:00pm and we should have it ready for you. So all morning we finished some more projects on the boat. Cleaned and greased the winches and rope stops, buffed the scratches we filled, and I made banana bread again. We also managed to fill the propane tank, stock up at the grocery store, pick up Finley's wife from work and back to the boat we went. It was 5:00 on the dot and we were worried nobody would wait for us at OBS. We decided that the call to confirm someone would wait is worth the 2-3 minute deduction on our cell plan. Okay i'll have to go back a day or two for a second. 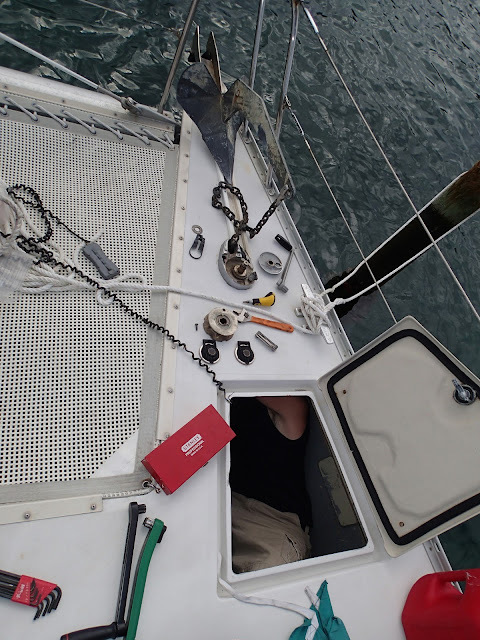 Dan, Preston, and Finley have been driving that huge anchor all around town the past 2 days looking for a buyer while looking for someone to compress some pins out of our windlass, realign the gears and put new pins in. So far nobody has been interested in either. There has been a standing bet for how much we would get for the anchor since they found it. Finley thinks $200+, Dan thinks $50, Preston thinks $100, and I think $0.00. Okay back to today. We have been running errands with this anchor that doesn't fit in the trunk, so part of it comes into the cab where one seat is down. It is a little squishy with just us four but we don't mind as we are happy for the ride. Stopped by the store and we packed in a full cart of groceries between the anchor, myself, and Preston. Now to pick up Finley's wife from work!! I ended up sitting on top of the anchor on top on a folded down seat. Dan, Preston, and the groceries are squished next to me in the back seat and Finley and his wife up front. I'm sure we looked like a clown car driving down the road. We all had a good laugh about how dorky we seemed. Now we are back at the marina moving the anchor and gas cans into Finley's box truck to go pickup our tank. We are rushing as OBS is closed and the owner is waiting around just for us. We are about 5 blocks from the marina and Finley is pumping the brakes and nothing is happening, there is smoke coming out the side of the truck and we are coasting down on the grass next to the road trying to stop. Pulled off the road Finley inspects the brakes and sure enough a seal or something has popped off. Now I'm thinking ohhh great we won't be leaving tomorrow and we'll be walking the gas tanks back to the marina. BOY was I wrong. Back in the truck to drive to OBS with NO brakes! Thats right NO brakes and an emergency brake that, well kind of slows us down. Don't ask me how but somehow we made it there and only had to make one left turn at an intersection because of traffic and we weren't stopping. Pretty funny pulling up and missing the gate by 50 yards because we were coasting to a stop. Anyway we got the tank, some screws, bolts, wire, props, and Finley got a dive knife. Who do you think won the bet on the anchor? Preston did! We received $150 in trade at OBS for the anchor. We split it 50/50 with Finley and we were on our way. Now it is dark and we only have one headlight and no brakes. Ohhh and no fuel. We need to pull into a fuel station with no brakes. I would have walked home if it wasn't so far and dark. I did not like driving with no brakes and 4 of us squished on the bench seat of a box truck. Again somehow we made it back to the marina with only one minor detour into a parking lot, because we could not stop for traffic. Only the parking lot did not have an exit and was too small to flip a U turn. We ended up plowing over some timber logs and back into traffic. We have been working on installing the tank, getting everything charged and put away and then off to bed we will be. At dawn we will be pulling out of the marina and heading to the northern end of the Abacos by way of the Little Bahama Bank. See you all in the Abacos!! Who can see what I see? YAY! What luck. You guys seriously luck out. I am glad you are safe! LOVE the seahorse pic. I know the girls will too when they wake and see it. Can't wait to read what is next. Atleast you had a policeman with you for quick and easy accident investigation. Bon Voyage on your Abaco Island destination! That sounds like a crazy day and way cool that you caught a seahorse! When I get married I'm going to want a shirt like Finley's in that picture. Have fun on your way to Abaco Island!